August 25. 1964 On this date, Archbishop Bryan J. McEntegart, Bishop of the Diocese of Brooklyn established a new parish wish was named St. Paul the Apostle to honor the reigning Pope, Paul VI and appointed Rev. Francis J. Kelly as pastor of the new parish in Corona, Queens. Rev. Joseph C. Pfeiffer was assigned as his associate to minister to the Catholics in the new Lefrak City housing complex which had recently opened along the Long Island Expressway. The parish boundaries were set by the Expressway on the South, Christie Avenue on the North, 92nd Street on the West and 108th Street on the East. The parish covers parts of Elmhurst and Corona in Queens. October 11, 1964 The first weekend Masses were celebrated in the cafeteria of Cathedral Prep Seminary on 57th Avenue and 92nd Street and were attended by 750 people. The following weeks saw the beginnings of parish organizations such as the Mens & Womens Guilds. The first parish census was taken and over 500 people registered to be members of the new church. October 30, 1964 Ground was broken for the erection of a temporary all purpose prefabricated steel structure (a Quonset hut) which was to serve as the church building. This temporary church which could hold 500 people cost $50,000. The parish intended to build a permanent church in the future. March 21, 1965 This Sunday, despite snow, the church was opened and Mass was celebrated in the building even prior to a sacramental dedication. In the Fall of 1965, nuns from Our Lady of the Angelus Church began catechetical classes at St. Pauls. Mr. Robert Noli and Dr. Seamus OHanlon were the first lay teachers of the parish to join the Sisters in teaching the children. Fall of 1966 By this time, it became obvious that there was a critical need for a building which could house the religious instruction classes and could also be used for recreational and social events by the parish. Since there were several parishes nearby which could accommodate the parochial education of our children, plans to build a parish school were put aside to build a parish center with an attached rectory. January 7, 1968 Auxillary Bishop, Most Reverend Joseph Denning broke ground for the new parish center after celebrating the noon Mass. 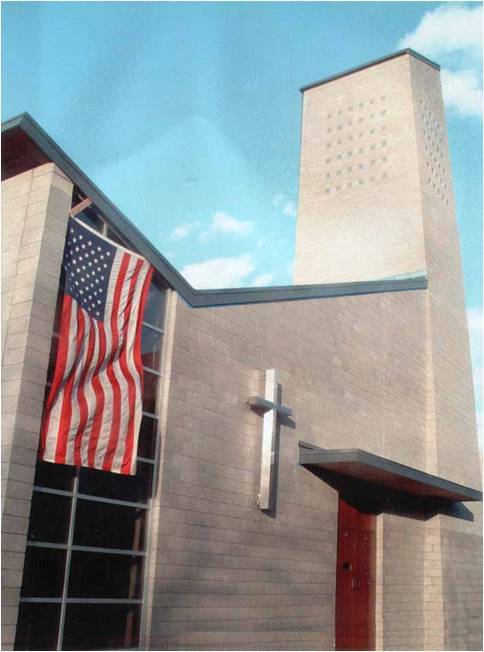 November 1969 Most Reverend Francis j. Mugavero, Bishop of Brooklyn, dedicated the new parish center. After blessing the cornerstone, Mass was celebrated in the new building. The total cost for the construction was about $600,000. The parish had $285,000 at hand for construction work and started a campaign to raise another $150,000. Fall 1973 - 1988 The parish pre-school program began under the capable leadership of Sr. Mary Ann Carotenuto. She was later followed by Sr. Karen ONeill and then Brother Bartholomew Boscia all of whom served as Directors of Religious Education for the parish. Mrs. Anan Baratau, who was an aide at the pre-school, now directs the Saturday and Sunday catechetical program for the children of the parish. 1980's This era was characterized by significant population changes affecting the community. Many of the founding parishioners moved away and new comers, many of whom were Hispanic, took their place in the parish. This ethnic shift lead to the need for a Mass in Spanish on Sundays. 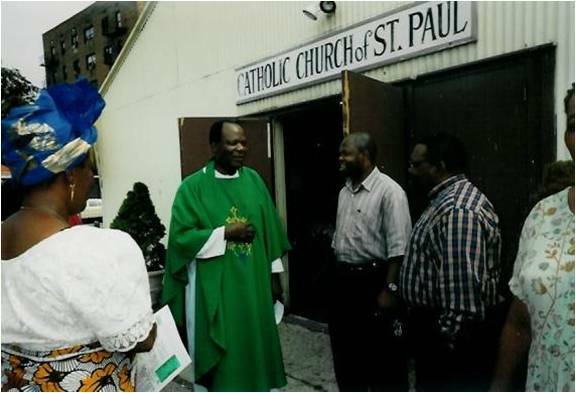 Many Africans and non-Hispanic Caribbean peoples also made their home at St. Pauls parish. In 1983, many members of the parish engaged themselves in a serious self study in trying to understand their mission and purpose within the wider Church community and the world. This resulted in the parish vision statement, published in the booklet, Renewal. The parish committed itself to build a foretaste of the kingdom of God in the midst of this city of man. With this thought in mind, the parish reached out to the less fortunate around them. In 1985, the first annual Christmas Dinner for people who might be alone on Christmas was begun. This dinner continues even now. 1990's At the start of this decade, the condition of the temporary church building began to deteriorate. The roof was leaking and during very wet weather, the floor would flood. Parishioners were not surprised to see their humble pastor, Fr. Paul Jervis, arrive at the church one rainy night only to see a flooded building full of people. He removed his shoes and socks and celebrated Mass for the faithful members of his flock who were there. In 1996, during the Alive in Hope campaign, Fr. Paul announced to the parish that a new church was needed which would be free of leaks and floods and which could accommodate the larger crowds which were now filling the space for the Sunday Masses. The parish raised $364,380 in pledges to the Alive in Hope Campaign far surpassing its goal of $118,000. Fr. Paul could envision another fund raising drive to secure the money needed to build a new church. December 6, 1998 Fr. Paul had offered the land on which the leaking church was standing to Catholic Charities who wanted to construct senior housing at the site. When these funds were granted, the impetus to raise the needed funds to build a new church gained momentum. This effort enabled the parish to surpass the $500,000 goal it had set in order to convince the diocese of the seriousness of building a new church. Permission to build a new church was granted to St. Pauls by the Diocese of Brooklyn in March of 2000. June 29,2000 A ground breaking ceremony was held on this feast of St. Paul for the new church. The cost for the project, however, had skyrocketed to $2,167,000. Fr. Paul placed the need for additional funding into the hands of St. Thèrése of Liseux. Needless to say, the church got built. During the construction, Mass was celebrated in the parish center. Sept. 11, 2001 Our hearts were broken when terrorists destroyed the World Trade Center in Manhattan. While the parish lost no direct members, we suffered with our friends who had lost relative. As a result of 9/11, workmen for our building job were scarce as many hands were needed to clean up the debris of the Trade Center. November 4, 2001 Our dream came true! The new church is complete enough to be dedicated by Most Reverend Thomas V. Daily of Brooklyn. A glorious celebration swelled the hearts of the parish. Over 1500 people attended the dedication either within the walls of the new church or in the attached parish center where the entire ceremony was seen on closed circuit television. With grateful hearts, the parish of St. Paul the Apostle thanks the Diocese of Brooklyn, but is most especially in debt to St. Thèrése, the Little Flower, who helped us get a new church. June 30, 2006 Fr. Darrell DaCosta was appointed as the new pastor of St. Pauls replacing Fr. Paul who was re-assigned to St. Peter Claver Church in Brooklyn. November 5, 2006 We held our First Annual International Dinner to celebrate the 5th anniversary of the opening of the new church. It was a rousing success with over 400 people attending. Many parishioners brought the food which was shared by all. Our Hispanic and Nigerian communities provided lively entertainment.